April 20, 2017 -- Charges have been filed against two suspects arrested following an investigation into the manufacturing and distribution of synthetic cannabinoids (Kush) in the Houston area. The suspects, Mohamed Ebrahim Moton (a/m, 47), and Ataur Rehman Malik (a/m, 38), are charged with delivery of synthetic cannabinoids in the 263rd State District Court. A photo of both suspects are attached to this news release. In September 2016, investigators in the Houston Police Department Narcotics Division initiated an investigation that identified an organization involved in the manufacturing and distribution of synthetic cannabinoids (Kush) in the Houston, Corpus Christi and Austin areas. Information was developed that identified Moton as a suspect in this case. On February 10, investigators conducted an undercover operation at an apartment complex in the 11400 block of Bissonnet, where Moton was observed carrying two large trash bags, later determined to contain Kush, and placed them into the trunk of a vehicle parked at the location. 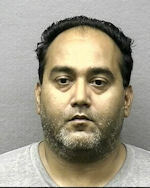 Investigators later witnessed Malik approach the vehicle, open the trunk and remove the contents. Malik was then witnessed conducting a narcotics transaction with a unknown individual. On Tuesday (April 18) HPD Narcotics investigators executed an arrest warrant at a residence at 11300 Mulholland Drive and took Moton into custody without incident. 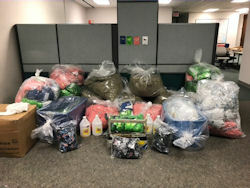 During the operation, investigators found about 550 pounds of Kush in various stages of packaging for distribution and other narcotics paraphernalia. 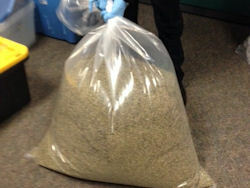 An additional 10 pounds of Kush was also recovered at various storage units identified during the investigation. Malik was taken into custody on Wednesday (April 19) following the execution of an arrest warrant, where a weapon and currency were also recovered. Photos of the total seizure, worth approximately $2.5 million, are also attached to this news release. These arrests and seizures are part of HPD's on-going enforcement into Kush dealers in Houston. This Kush initiative has targeted not only street-level dealers, but also stores where Kush is sold and now distributors and manufactures of Kush.